Ever since Monolith Soft went from being part of Bandai Namco to being an internal Nintendo studio, there’s been a change in the way the studio develops its games. Monolith Soft’s staff—who originally made a name for themselves with Xenogears (PS1) and then XenoSaga (PS2)—had a certain way of doing things. They would typically come up with a story they wanted to tell, write an extensive lore bible that outlined the game's worlds and characters, and then design the game around the contents of this bible. This changed with the Nintendo acquisition. Once they were acquired by Nintendo, Monolith Soft began to take on more of their parent company’s development habits—and for the better. With Xenoblade Chronicles, they identified a gameplay concept (along with an overall story concept) that appealed to them, prototyped it extensively, and designed the finer points of the story around the game world and “playability” within. There’s a common misconception that Xenoblade Chronicles was the first RPG project that was indicative of this shift in Monolith Soft’s development practices, but that isn’t quite true. 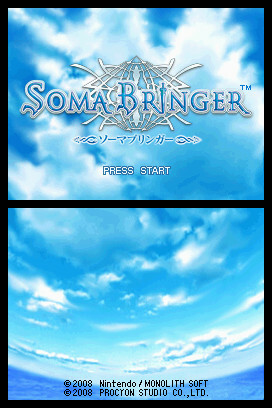 The game where Monolith first began experimenting with this development style is actually a Nintendo DS action-RPG named Soma Bringer. 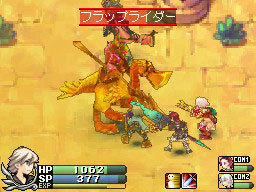 Think of it as a Diablo-styled game for the DS—one that was never released outside Japan. It's one of Monolith Soft's best, and least known. Below is a translation of a talk between Soma Bringer producer Tetsuya Takahashi and his longtime friend/collaborator, composer Yasunori Mitsuda, president of Procyon Studio. The talk is from the old Nintendo Touch Generations website which no longer exists, and the discussion between the two highlights Monolith’s approach to designing Soma Bringer. It’s a piece of Monolith’s history that is often overlooked, so hopefully you enjoy reading it. Takahashi: For Monolith Soft, this is the first full-fledged title aimed at a portable device. At the time, the DS had just come out, so the project came from the idea of trying to design something interesting for the DS. Then, I thought that if I was to be the producer the music would have to be composed by Mitsuda-san, and so my call to ask for his cooperation marked the actual start of it all. I’d known Mitsuda-san for quite a while already—we’d first met working together on Chrono Trigger. Mitsuda: Chrono Trigger was my debut work as a composer. Afterwards, I worked on Xenogears and XenoSaga with Takahashi-san. I’ve been working with Takahashi-san for over ten years now, and this time around, too, I was fully in charge of the music. Takahashi: The fact that as a composer Mitsuda-san writes music that can heat up a scene or even elevate the entire game was a big part of the reason I asked for his help, but the technical aspect linked to working on a game for DS was also part of the reason. Even if one can write good music, making it sound as expected on the hardware that is the DS is actually quite difficult. And so, I thought that if I wanted a composer that could do both, it had to be him. Mitsuda: On the phone we did decide that if we were going to do it, we might as well aim for the best possible quality on DS. Takahashi: At first, we experimented with the format of a standard RPG. 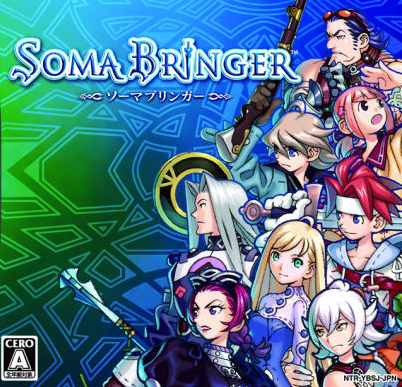 However, when thinking about things that were feasible “because it is on the DS"—such as playing with everyone or enjoying the game even if only playing in short bursts at a time—we thought that an action RPG was more appropriate for what we wanted to make, so we discarded what we’d worked on so far and remade it from scratch. I believe that, as a result, we managed to express the feeling of exhilaration and speed, which only exists in action games, quite well. We also experimented with the creation of the scenario this time around. Up until now, when creating a game for a home console we’d first have the scenario, then we’d build the game system to match it. However, this time around, we first decided what kind of game we wanted to make, then made rough estimates of the resources we could use, then assessed how many chapters and dungeons could be made, and then in regards to those we created eight characters and finally considered how to split the scenario up. So rather than building a game for the sake of showing an existing scenario off, I believe that this title’s theme and world were naturally built based upon the game format we wanted to make. Takahashi: This title’s story takes place in a world where Soma energy resides in everything. The word Soma has many etymological interpretations, such as being something spiritual or God’s miracle drug—that is to say nectar. So the original idea was to use those nuances and have Soma be a sort of omnipresent energy. As for this world, or rather planetary setting, we actually had several plans focusing on the story possibilities and ideas for expansion [in the future] from the very start. In the first plan, that is this game, rather than use up the whole world, we chose the plot thread most suited to action-RPGs, which recounts the events related to the Ring* circling the planet. * Ring: The huge ringed structure that circles the planet on which this title takes place. Mitsuda: The song "Ring” that plays during the opening was born immediately after I received the prologue poem from Takahashi-san. The verses had made a big impression on me. At first, I’d written the song for the piano, but as the contents of the opening animation depicted some kind of light coming from the sky, I thought it would be nice to give it a clear feeling and recorded the chorus of three women together, and that’s how it became what it is now. Takahashi: I said earlier that ever since the start of this project I wanted to ask for his cooperation for the music but, in a sense, we could say that the groundwork for this game was laid based on its music. In other words, I believe that this project could not have seen the light of day without Mitsuda-san. Mitsuda: I’m honoured (laughs). At first, when I heard the title of the game, considering it was to be made by Takahashi-san, I imagined there would be some sort of grand theme involving gods, spirits, or some such invisible energy. Then, when I actually received the scenario, yes, there was a grand theme of everyone being guided by the “Soma,” but at the same time I was really impressed by the human drama surrounding each character. Then he suggested we put the emphasis on the human drama this time around, so my mindset, too, was slightly different from usual during composition. Takahashi: For this title we thought things through so that it would feel good to play as an action-RPG. The point of this game is the cooperation with your partners for the attacks; however, if you keep dealing damage to the enemy you’ll enter Break mode, which gives you the opportunity to perform rapid attacks in quick succession. During this mode the enemy can’t move, so you can attack to your heart’s content, but we paid particular attention to the exhilaration you get when using a skill during Break. Depending on the skill, you can send the enemy flying into the sky, or strike a flying enemy down with a killing blow. I believe we’ve managed to create a fighting system that is both simple and exciting. We’ve also made the HP loss easy to understand, so you have a clear visual representation of how much damage a skill does. 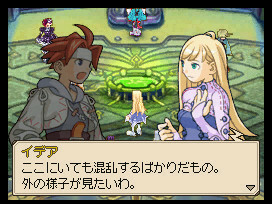 There are many kinds of action-RPGs, such as, for example, games in which you put in puzzles to clear in order to move on; however, we wanted the player to focus on the battles in this game, so we avoided such gimmicks as much as possible. As a result, I believe we’ve managed to make it so that the player can concentrate of the pleasures of defeating the enemy or discovering how to do this. Mitsuda: This game’s core being the enjoyment of the fights, my theme for the sounds was to make songs and sound effects that give off a feeling of speed, while still sounding pleasant to the ear. For this title, I’ve been doing and redoing the songs and sound effects while paying particular attention to that aspect. Takahashi: There are other design choices made to facilitate the enjoyment of fights as well. For example; once they’re used to the fighting system, the player might just avoid the monsters they’re not interested in. But if that happens, the monsters lose their meaning, so in order to avoid that we made it so that if you beat a monster you might get an item better than the one you have at the moment. Usually, one the same weapon type will always have the same stats, so even if you find more of it, it’ll just go into your bag and all get sold alongside everything else later on. 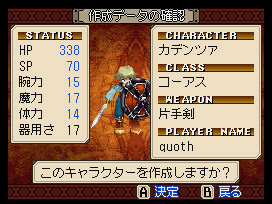 However, in this game, aside from the same basic parameters, each weapon has a particular effect, so even if the monster dropped the same weapon as the one you have equipped, the new weapon might just be much stronger than yours. It is precisely because we wanted it to be an action-RPG in which you enjoy the battles themselves that we made it so that the player would feel the urge to defeat every last monster he finds. Takahashi: Thinking that it’s more fun to have a variety of weapons or skills to choose from in an action-RPG, we’ve prepared over 300 weapons. From the very start, the concept was to have people enjoy the game over and over again, so we made it so it’s impossible to acquire all of the weapons just by clearing the game once, and the same can be said of skills. Moreover, there are different strategy patterns depending on the weapon and skill combination, and we’ve also prepared skills which might have different uses [depending on the weapon]. Also, you can freely customize the skills of the character you control. At first, we’d made it so that once you allocate points to a skill, you couldn’t undo it, but as we progressed we thought that being able to re-allocate the points as many times as you want would create the opportunity to try different weapons and also widen the combat possibilities, making it far more interesting. So in the end, we made it so that the player could discover his own strategy through trial-and-error. Takahashi: This game is not only playable in single player mode but also in multiplayer via the DS wireless connection. The main appeal isn’t the fact that the “multiplayer mode” is a separate thing from the main story, but that we made it so that you can play at any point in the game even with people at different points of progression. Basically, all players go along the game scenario of the host’s game, but we made it so that everyone could enjoy themselves together. For example; the contents of boss drops change every time, so you might just get an even better drop by defeating the boss again, and as a result the players ahead in the game can enjoy coming back. On the other hand, late players can get good items from other players through trading, so once they get back to their singleplayer game they can move on more easily. The items won during multiplayer are kept when you get back to singleplayer, so you can make the most of them there. Mitsuda: The action tends to steal the spotlight, but the events are also quite worthy of note. The characters’ subtle actions make it feel really dramatic. Mitsuda: Is in perfect sync. If you don’t go speed reading, that is. If you read and make the dialog progress at a normal speed, the setting will change just when the music reaches its peak, so I hope you’ll read the dialogue as much as possible without skipping text. Mitsuda: The story of this game is divided into several chapters and takes places in towns rich with distinctive colours. So, in order to give a particular feel to each town, I decided to introduce a set of instruments for each chapter while composing. For example, for the desert chapter I used the tabla and the sitar, while for the chapter of the mechanical town I used industrial instruments such as metallic instruments or the electric guitar. As a result, the “colour” of the music changes completely from chapter to chapter, so I believe it makes the game even more enjoyable. Takahashi: I really like that in the desert field the music starts with marimbas and more instruments progressively join in, heating things up. Mitsuda: That marimba represents the desert sands. The sandstorm that grows stronger or weaker. It’s also one of my favorite pieces. Another one would be the Largo Bridge field music. The music really matches the heroism of the Pharzuph troops going to battle in order to save others. Even when you’re fighting out in the field, that scene is really moving. As an aside, this game’s fields are quite spacious. As such, the player spends more time in the field, so if the music weren’t longer the player would get fed up with it. So I made the tracks fairly long before they loop, so each song is actually packed with a variety of musical compositions. Mitsuda: One might tend to think that it’s easier to produce sounds on the DS rather than on a home console, but in a way it’s much easier to play sounds on home consoles. Unlike on a TV, it’s difficult to play bass sounds through the DS speakers. The bass supporting the low tunes of the music disappears, and as a result a musical unbalance often appears. Which is why, this time around, my work started with the investigation of the DS speakers’ characteristics. Studying everything by recording the DS speaker sounds with a mike and determining the bandwidths with peaks, what is the lowest audible bandwidth, and so on. Then, taking all that into account, I composed songs that play in the best sounding bandwidth. Also, for the music to sound the best even with headphones on, the player can choose whether they play with the speakers or headphones. For that purpose, in this game each song has two mixes—one for the speakers and one for headphones. The bandwidth differs between speakers and headphones, so I adjusted the sounds to match the properties of each. For example; while for the speakers I put the bass at the lowest bandwidth available, in the case of the headphones it’s even lower. Mitsuda: This time around, the early purchase bonus is a mini soundtrack CD. The contents haven’t simply been ripped from the DS; instead, just like image albums, it’s a CD specially made by recording the music anew in a MIDI format. These versions of the music tracks can’t be heard anywhere else but the bonus CD, so I hope people will get them. We’ve also readied the game’s soundtrack [to be released on April 2nd, 2008]. In addition to all the songs present in-game, there are four bonus songs on this 3-CD album. For the four bonus songs, I chose songs that were cut short because of space limitations when put in-game, or where the quality was compromised, or which sound very different on the DS than in their original form. I hope you’ll listen to them and experience them in their original form. Mitsuda: There might be people who, upon hearing “action-RPG,” will possibly think that this is a difficult game or that you won’t be able to progress without good reflexes. However, this game is well-balanced in that respect. The story is solidly built out of role-playing components, so I believe it is a game in which the story, music, and action are all enjoyable. I hope many people will play it. Sound-wise, I took my time and composed the soundtrack with the utmost care, so I’m personally quite satisfied with the result. It’s fine to play just in order to listen to the music, too. (laughs) I just want everyone to listen to all the songs. Takahashi: Due to our desire to have as many people play it as possible, we were extremely careful with the difficulty balance so that even those not used to action-RPGs could progress through the story. Even if it is a completely new title, we made it so that its accessible to anyone, so please do try it out. This game is made so that you can play with your siblings, family and friends, so I hope everyone will get together and try playing with each other. Also, once the game is cleared, three new dungeons are automatically added. They aren’t dungeons we just tossed in, but contain new episodes complementing the main story, so please do check them out. Another bonus is that once the game is cleared, you can choose the game’s level of difficulty, making it possible to enjoy fighting even stronger opponents, so I’d be happy if you’d enjoy playing it over and over. Translated by Claire Rouveyrol. Edited by Ishaan Sahdev. Images courtesy Nintendo. This post will be used to keep track of global sales of the Legend of Zelda series. It's official. The Legend of Zelda: Breath of the Wild is the highest-selling Zelda game in Japan since 1998. There’s been a lot of debate as to whether game demos are good or bad. Enter your e-mail below to be notified whenever a new post goes up.